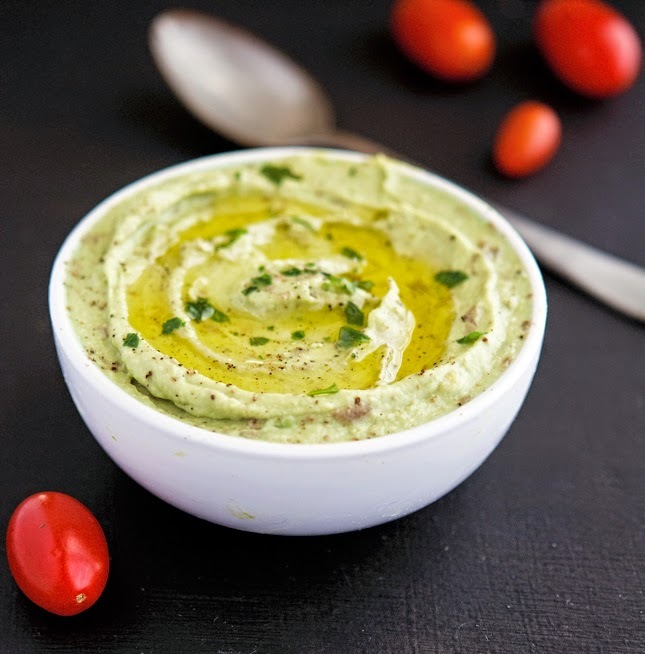 This avocado hummus is a bold interpretation of the classic Middle Eastern dip, in that I swapped chickpeas with avocado. You’ve heard that right, no chickpeas,. Now, before you get all riled up and start chasing me with a water gun, a pitchfork - or even worse - a meat cleaver, give me a chance to explain myself. It is true that “hummus” is an Arabic word that means "chickpeas". Meaning that if you’re bit of a purist, hummus can only be made with chickpeas. However, if you’re open to the possibility that sometimes things can be made differently, and you’re not afraid of making spaghetti out of zucchini, bread out of cauliflower, and brownies with sweet potatoes, then maybe the idea of making hummus with avocado might be the right thing for you. One of the beauties of hummus, as far as I'm concerned, is how easy it is to sling together at the last minute. This avocado hummus is no exception: two avocados, a spoonful of tahini, some lemon juice, garlic, some cumin, a minute flat in a food processor and you’ve got the making of lunch. As well as plenty of time to reflect how incredibly good this hummus is, notwithstanding the fact that it’s sans chickpeas. Avocado Hummus Print this recipe! Crush the garlic and one-half teaspoon salt in a mortar (or in a small bowl) until pureed. Transfer the puree to the bowl of a food processor (or blender), add the tahini paste and lemon juice and process until white and contracted. Add avocado, cumin, and cayenne pepper (if using) and pulse until smooth, at least 60 seconds. Make sure there are no chunks of avocado hiding in the middle, you want a smooth consistency. If too thick, thin to desired consistency by adding a bit of water, one tablespoon at a time. Serve, sprinkled with parsley and drizzled with olive oil. One serving yields 189 calories, 18 grams of fat, 10 grams of carbs, and 2 grams of protein. Not only am I open to the "possibility that sometimes things can be made differently" but I am a huge advocate of it! Love your take on hummus, Mike - love the cumin and cayenne in this concoction! Hey Anthony, welcome to TIY! I do love roasted carrot hummus, I make it all the time and it's such a great dip (thanks for the remainder btw). I love adding cilantro and jalapeno (and/or smoked paprika) too, the bring so much flavor! Love avocado hummus! I often mix chickpeas with avocado and call is garbanzo-mole ;) love your take too! everything with avocado becomes yummy! "Garbanzo-mole" is hilarious, I love it. I'm gonna adopt it! Yum. I have some avocados I need to use up. 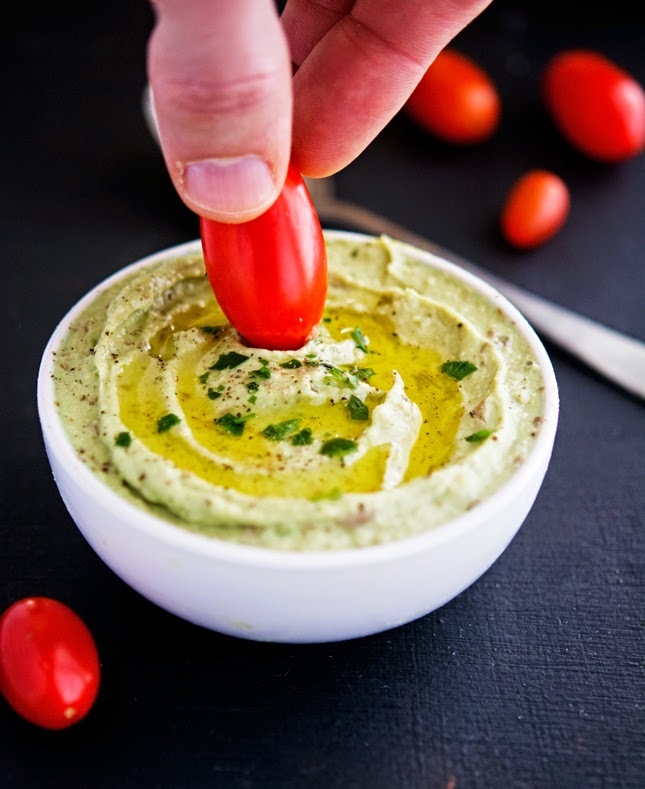 That's fantastic then, no better way to use avocados than making this hummus! I love avocadoes, this looks wonderful! I committed several hummus sins in my blog, avocado hummus included, and was gently reminded by a reader that "you should not really call it hummus" - oh, well.... chase me with a pitchfork too, I can still run, avocado in hand. I'm heading over your blog to check it out Sally, I'm curious! Mate, I've been experimenting with various hummus twists without chickpeas (much to my Middle Eastern mum's chagrin) but never thought to try it with avocado! You sir, are a genius. as a great lover of guacamole i am very intrigued by this! i love hummus but definitely get tired of the same old recipe. time for me to try something new! Amen A! Time to bring a new twist on hummus, right? My hummus goes off very quickly, is there anything I do wrong or you is that what happens with fresh homemade hummus ? You should store hummus in a airtight container in the fridge. If you do so, it should last at least for a week, even more than that. Hummus is a pretty stable concoction. Cooked chickpeas, lemon juice, salt, garlic, tahini paste...all ingredients that do not spoil that easily. Are you calling me a liar? How dare you! I'm Alpha and I never lie! I love chickpeas too much to eliminate them from hummus, so I think I'm going to try a combination of avocado and chickpeas. The avocado would add a great creaminess to it I think! Thanks for the idea! You can definitely use a combo of both chickpeas and avocado in your hummus. But at least once, tried sans chickpeas. I'm sure you'll be surprised by the outcome! I do find myself getting tired of classic hummus, too...maybe it's the texture that gets to me by the end of the week. This recipe looks AWESOME, and I've never had avocado hummus before. Pinned this to Pinterest for future cooking! A great way to use avocado. I constantly struggle to find ways to incorporate this. It's definitely something I would love to do the next time i'm in a hummus mood, which I am all the time. This is 100% over-the-top awesome! I've tried raw hummus recipes with zucchini and avocado before, but I think your version takes the cake on them all - absolutely can't wait to try this! I've made your recipe twice. The first time as written, and the second go round, I was in the mood for a little spice, so I added a jalapeno - delicious and spicy! Thanks for the terrific recipe! I'm so gonna try adding a jalapeno too. I love me a good kick in my hummus! Excellent! I made it this morning for breakfast with homemade tahini, it was enchanting taste. Thanks for an idea of how to mix my two favorite - tahini and avocado! How long can this recipe keep in the fridge?